Gary Rosenzweig looks at three iPhone Game Apps available at the iTunes App Store. Scrabble is the official version of the classic board game. Galcon is a strategy game played like an arcade game. Aurora Feint is an interesting adventure and puzzle game. You can also play free iPhone games at MacMost.com. Scrabble Champs On Jimmy Kimmel live! May 11th. Over the years, Scrabble has been one of the more popular board games for people of all ages. Now you can take your favorite classic Hasbro word game anywhere you go, thanks to the Scrabble iPhone app released by Electronic Arts. Electronic Arts has been in business since 1982. Since that time, the company, commonly known as EA, has developed many popular games for various gaming consoles, personal computers, wireless devices, and the Internet. EA is headquartered in Redwood City, CA and has grown to the point that it employed over 9000 people worldwide in the year 2008. Today, EA is perhaps best known for its sports and action based video games, including the Madden NFL series and the Need for Speed games. The popularity of EA’s iPhone apps, such as the Scrabble one, cannot be ignored, however. Since its release on July 9, 2008, the Scrabble iPhone app has sold very well in the iTunes store as well as on Gamestop’s website. In fact, the Scrabble iPhone app is ranked in the top 1300 of over 9600 iPhone and iPod game apps available through Gamestop. Basic game play is the same as the board game, and the Scrabble iPhone app has many positive points. Users are very pleased with the options for solo play, including the fact that the CPU you play against is actually a challenging opponent and not one that is impossible to beat or far too easily defeated. You can also play alone without a computer opponent. Multiplayer options include pass and play for playing with friends in person, multiplayer Wi-Fi for online play, and even a Facebook app. 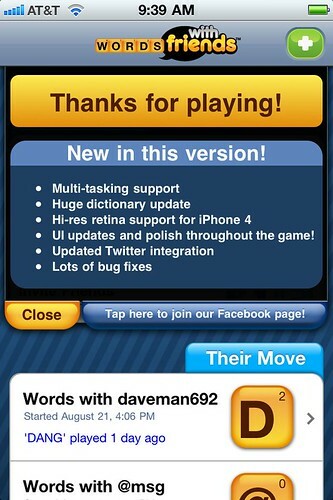 The clear graphics and ease of play with the Scrabble iPhone app are also praised by users. The low cost of this app only adds to its appeal. If you enjoy the classic board game of Scrabble, you will definitely love the Scrabble iPhone app. You will be able to enjoy your favorite game and expand your vocabulary everywhere you go. EA has certainly scored a home run with the Scrabble iPhone app, and this app is a must for even the occasional Scrabble player. Read a more in-depth review of the Scrabble iPhone app here. For more information on popular iPhone applications like Pocket God or to read more reviews of iPhone apps visit AppCraver today. AppCraver is dedicated to iPhone apps, news, reviews and interviews with iPhone application developers.